Every time I see a ready assembled vegetable platter at a grocery store, just to pick up and go to a party, I cringe at its cost. I think it mostly reflects the price of labor, rather than the value of the veggies. I can understand if you are in a hurry and rally do not have time to put it all together, but even that is not a good enough excuse. It doesn’t take a culinary genius to cut up raw vegetables, and to arrange them on a platter. 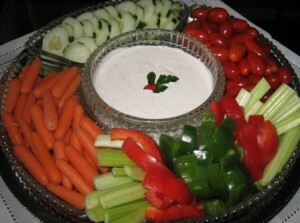 Even if you still have to buy the ready made dip, you will save money, doing the platter yourself. I know once you add up the cost of these items you might come up close to what the platter costs, but you will not use up all of these vegetables for this one platter. You will have leftovers for your own use. If you want to cut down the price even further, skip the peppers all together, and fill up that space with celery. Also, instead of cherry tomatoes you can select broccoli and cauliflower. You may also substitute the baby carrots with regular carrots, peeled and cut them up to chunks (french fries size), these will also cut down on the cost of carrots. It all depends on your budget and the current price of vegetables. Maybe you don’t have a vegetable platter to arrange these on, or you don’t want to use your own and worry about bringing it back home. In that case, stop at a Dollar store and purchase one for a Dollar. Once all assembled, wrap it up with foil, or plastic wrap, and off you go. Not only you will same some money, you will feel good about your creation, and maybe impress someone as well. flavored salad dressing mix, mix it all up, spoon it in a plastic container and it’s ready. Money saved again. This whole platter will cost about $6, if you do it yourself. Simple yet tasty. I totally agree with the author. I cant believe anyone would buy a premade vegetable platter for 3 times the cost of making it yourself! Also I often mix Dukes mayonnaise with the sour cream for my dips. As they say “Penny saved, is penny earned”, more so now than ever, during this awful economy. How many would this serve along with a fruit plate and a sausage and cheese plate at a happy hour before a big meal? Sounds like you are planning a very nice happy hour, with your appetizer selection, and in addition you are offering a large meal afterward. I would say it should be enough for at least 10-15 people, if not more. It all depends on how much time you are allowing between the happy hour and the meal. The shorter the time (lets say 1-2 hours), the more people you can serve with your selection. You can always have some mixed nuts and chips, in case your food supply starts running low sooner than you expected. Generally, women tend to snack less than men, so it might depend on your male/female ratio.